This chapter describes the process by which data are transmitted from sensors onboard a spacecraft to the point at which these data are used for attitude determination by a software system. 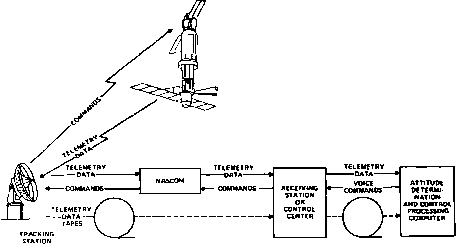 Section 8.1 provides an overview of the data transmission process from the spacecraft to the attitude determination software system, and the command transmission process from the ground to the spacecraft. Sections 8.2 and 8.3 provide a detailed view of two particular aspects of interest— the content and form of the telemetry data, and the process used to associate a time with the telemetered data, or time tagging. 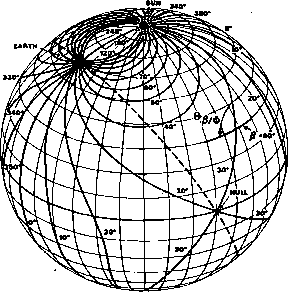 Section 8.4 describes the part of an attitude software system which transforms telemetry data into engineering data. or tape recorded for later transmission. Two or more of these functions may be performed simultaneously. Several types of measurement require analog-to-digital conversion (ADC) of the value of a physical quantity before storage or transmission. Analog measurements of voltages are often digitized by measuring the time required for a ramp voltage of known slope (i.e., linearly changing with time) to equal the voltage being measured. The time required is proportional to the measured voltage and is stored in binary form in memory chips in parallel format; i.e., each memory chip contains a bit which is either 0 or 1. The stored value is later transmitted via telemetry in serial format; i.e., the bits are transmitted one at a time, usually the most significant bit first. Some measurements, such as digital sun sensor data, are intrinsically digital and need not be converted before transmission. Such measurements frequently occur in a Gray rather than a binary code, as described in Section 6.1. Other types of hardware which provide digital data include optical or magnetic shaft encoders, gyroscopes, and pendulum dampers. A third common measurement is a time interval between events, e.g., the time between successive Sun pulses, the time between a slit Sun sensor pulse and acquisition of the Earth's horizon by an Earth sensor, or the time between acquisition and loss of an Earth presence signal. These measurements are generally made by a crystal-controlled oscillator circuit which counts the number of vibrations of a piezoelectric crystal between the two events. Measurements are sampled from sensors in a cyclic order, the sampling rate being determined by a spacecraft clock (a crystal oscillator). Sensors often produce signals which are not directly suitable for telemetering. In these cases, the sensor output is applied to the input of a signal conditioner, which adapts the signal to suit the input of the telemetry transmission system. This process includes signal amplification and, when necessary, analog-to-digital conversion. Sensors typically requiring signal conditioning include thermocouples, strain-gages, variable reluctance devices, and small-change variable resistance devices. Sometimes a single signal conditioner may be used with more than one sensor, allowing several signals to be multiplexed into the same conditioner; i.e., the same signal conditioner is used on a timesharing basis. Sensors which do not generally require signal conditioning are potentiometer pressure gages, accelerometers, bimetallic thermometers, gyroscopes, displacement gages, and angle-of-attack meters. Figure 8-2 summarizes the process of sampling the sensors and inserting the sampled data into the telemetry stream together with other information, such as the synchronization (sync) pattern. The multiplexer, driven at a rate determined by the spacecraft clock, samples various sensors via the signal conditioners. These data are fed into the encoder, which generates digital data corresponding to the analog output from the multiplexer. The encoder output then goes to the signal mixing gates, which transmit one signal at a time, in a time-ordered sequence. The signal going to the telemetry transmitter is determined by the mixing gates, based on the spacecraft clock. The spacecraft clock supplies time interval information to the sync generator, which supplies the sync pattern characteristic of the spacecraft. Nonmultiplexed data (such as time history codes, output from an onboard computer, and output signals from sensors producing digital data) are interleaved with the multiplexed data. The bit rate at which data are transmitted is an integral power-of-two multiple or submultiple of the spacecraft clock rate. The manner in which the PCM pulses are generated depends on how transitions from 1 to 0 are treated by the transmitter. The three most common methods are illustrated in Fig. 8-3. In nonreturn-to-zero level (NRZL), ones have a specific assigned voltage and zeros have another. The signal remains constant during the entire bit period in both cases. In nonreturn-to-zero mark (NRZM), there are two voltage levels, but neither corresponds exclusively to ones or zeros; the voltage level changes value whenever a 1 occurs. Finally, in return-to-zero (RZ), a 1 is represented by a pulse for one-half the bit period and a 0 is represented by no pulse at all.